Saturday, March 18th 2018 - It's been a while since I've updated you all on our progress here at Ohio Time Machine Rental (OTMR) and I have much to share! With roughly a month and a half to go before we officially go live, OTMR has booked two gigs for May, and several others are in the process of scheduling. Plus, we've been hitting the social outlets making a lot of really great connections here in the Columbus area! Earlier this month we attended an amazing event meeting Ernest Cline, author of the best selling novel, Ready Player One and I can't wait to tell you all about it! For those that do not know, Ready Player One takes place in a dystopian Columbus, Ohio in the year 2044. The book follows protagonist Wade Watts in a search for an "Easter Egg" in a worldwide virtual reality video game, that can lead to the creator of the games vast fortune! The book applies many references to 80's films, games, songs and TV shows; which is right up my alley, being such a fan of the 80's! Best of all the main character uses a modified DeLorean Time Machine as his mode of transportation! The Ernest Cline event also drew the interest of the DeLorean Club of Ohio. I was really happy to see they came out with several of their cars! 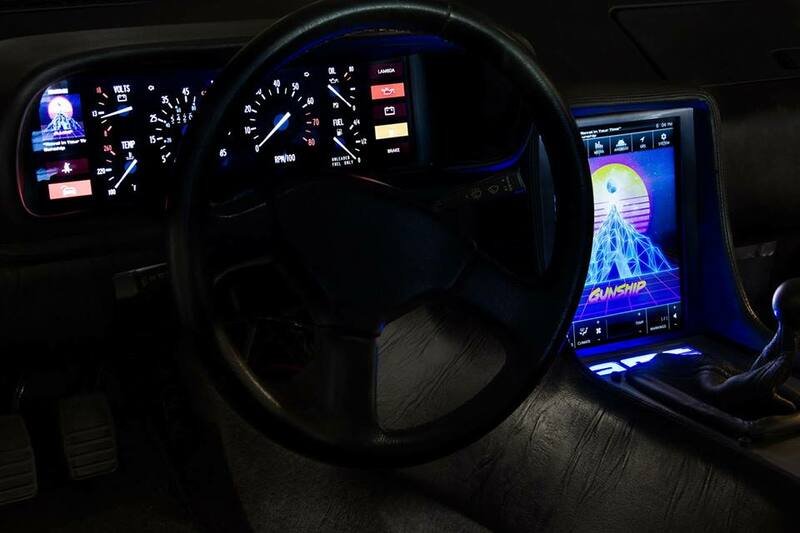 Plus, I was able to meet a few members and catch up with member and DeLorean owner Kevin Krinn (look for a blog about meeting Kevin soon) because he'd just finalized his digital dash and I was waiting to see it! As expected, it was awesome, check the photos below for a look at the finished product! On the day of the event I arrived an hour and a half early anticipating to be the only one in line, but to my delight, the line was wrapped around the building! Once inside I was introduced to a childhood friend of Ernest Cline, his name is Andy, and he shared his childhood fun and memories! We had a lot in common and chatted for a while, which made meeting the man behind the book even more exciting! Plus I ran into one of Bruce Coulombe friends, Craig, who drove from Toledo (3 hours) to be there! Small world! As you know Ohio weather is not... predictable so Ernest Clines flight was delayed, making him a bit late for the event, but we were still very happy to hear that he was on his way from the CMH airport! All of a sudden voice came from the podium proclaiming "He's here!" A young lady was holding the mic, trembling a bit as Ernest Cline walked in, making a hastily approach to the stage. Full of energy and a positive vibe, Ernest welcomed the audience and immediately went into his speech. He started with the history behind the novel and his passion for writing. As he spoke I could tell he was grateful for what got him to where he is now and that he hadn't forgotten where he came from. He spoke very highly of his brother and I could tell regardless of the fame he has received, he's just a down to earth, humble guy from Ohio who values family and friendship above all else. Ernest Cline spoke for about an hour and began to sign books. Though getting a picture with Ernest Cline was not an option due to time constraints, he was gracious enough to sign three books per person! And let me tell you he was just such a respectful and patient person. He took the time to answer questions and shake hands. Before I knew it I was standing in front of him. I had three books for him to sign: One was for my daughter and the other two were for two of my students. I said "Hello Sir nice to meet you! Bruce Coulombe says hello!" Ernest Cline Looked at me with a puzzled look and said "Bruce? You know Bruce?" I smiled and told him "Bruce is building my Time Machine and Bruce had mentioned that he had helped you in repairing your flux capacitor." Ernest smirked and let me know that Bruce was a great help and, like me, thinks Bruce is a stand up guy. We continued to talk for about the Time Machine, specifically certain parts on the car Ernest Cline is wanting to improve and how Bruce is building my car. Once we finished talking, Ernest Cline reached his hand out to me, letting me know it was nice speaking with me, a class act to say the least and I hope to get the opportunity to meet him again! A great day for sure and many more to come! Stay tuned for more updates as we get closer to our launch date and make sure you go see Ready Player One opening in theaters March 29th! Newer PostRent A DeLorean Time Machine For Any Event! Older PostRenting a DeLorean Time Machine in Columbus, Cincinnati, Cleveland and Indianapolis!